JVC DLA-HD350 review | What Hi-Fi? JVC's range of home cinema projectors extends to a modest total of three machines. Two of these, the DLA-HD100 and DLA-HD750 have already blazed a trail in this magazine, achieving five-star status in the process. 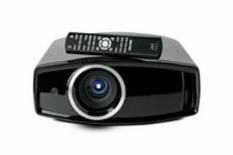 That just leaves this, the entry-level DLA-HD350 as the final piece of JVC's projector puzzle. The exterior design is identical to that of its more expensive sibling, the 'HD750. It's an attractive slab of a projector, that's available in glossy black (pictured) or a striking, glossy white alternative. The JVC uses D-ILA technology, as opposed to LCD or DLP, boasts Full HD resolution and, according to the blurb, features a native contrast ratio of 30,000:1. The supplied remote control won't win any style awards, and could be quicker to respond, but it is at least backlit to help you in a darkened room – and the projector's feature-set helps smooth out any operational bumps. Built-in test patterns help you centre the projector on your screen. Lens shift (horizontal and vertical), zoom and focus are all motorized which makes life very simple too. All the menus are clear and concise, and for keen tinkerers you can tweak in-depth settings such as colour temperature and gamma. To help squeeze the internals into the chassis, the video inputs have been placed, unusually, along the side of the projector, towards the front. This could be a little tricky for some set-ups, but it's just a case of making sure that your HDMI cable can stretch to one of two inputs. Once it's up and running, it's difficult not to admire the 'HD350's pristine picture. Performance is exemplary, the JVC exhibiting the punch, luxuriousness, smooth motion tracking and natural colour balance that we've come to expect. Levels of contrast and black detail are both exemplary. When Nic Cage comes face to face with Earth's visitors in Knowing the 'HD350 isn't perplexed by the dark surroundings and uncovers a superb level of detail in the shadows. So, the 'HD350 continues JVC's five-star projector streak and should make for an interesting comparison to current class leaders at this price point.